Apple appears to be shortening review times for new app and update submissions to the App Store. According to data collected by independent app review tracking website AppReviewTimes and as reported by Bloomberg today, review times have approached 2 days as opposed to the 7-10 days it took Apple to review apps in the past. The Mac App Store, which is smaller in volume than the iOS App Store, is currently seeing app review times of 24 hours. In addition to AppReviewTimes' crowdsourced data, anecdotal experience from my own conversations with developers indicate that, particularly over the past two weeks, approval times of 2-3 days have become quite common for iPhone and iPad apps. Apple's App Review has been a contentious topic in the Mac and iOS developer community for years. In March, we surveyed over 170 developers and, among various issues such as inconsistent enforcement of guidelines and lack of communication, the majority of developers noted that App Review needed to be faster. App Review needs to get faster; one week is too long. This was a nearly universal sentiment amongst the developers surveyed. In addition to the obvious “hire more people”, there were a range of other suggestions for how Apple might accomplish faster reviews. In March, we were also able to put together a chart plotting iOS App Store review times since January 2015 using 7,000 data points provided by AppReviewTimes. As we noted then, the average "rarely dropped below 6 days and was often at 8 or more days". Having a processing time of 2 days is, therefore, quite an improvement on Apple's part. The question is whether such change is a temporary anomaly or if it will be the new standard going forward. Bloomberg's story associates shorter review times with Apple's goal to retain developers on their platforms and increase revenue from the App Store. It's important to note, though, that Apple hasn't promoted shorter review times as a recent addition to their developer program. On their App Review Status webpage, the company simply states that 99% of new app submissions and updates for iOS and Mac have been reviewed in the last 5 business days as of May 6, 2016. 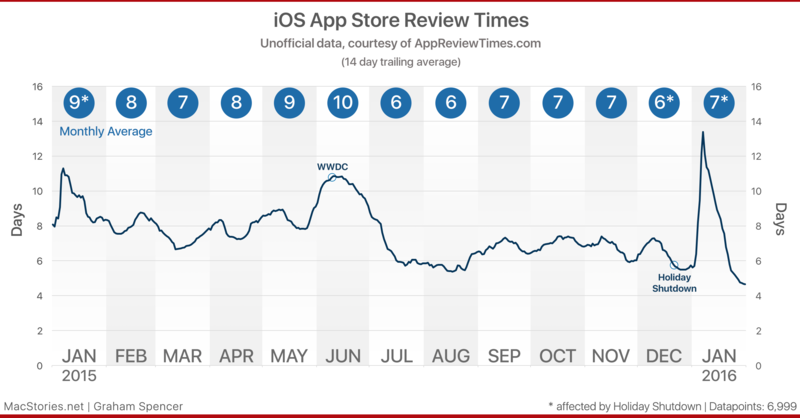 However, data from AppReviewTimes has proven to be accurate in the past, and I'd tend to believe that review times are indeed at the lowest they've ever been in an effort to improve App Review and build up developer goodwill ahead of WWDC. Apple's slow app review times have become a staple of the app economy over the past several years, with developers having to plan app releases and bug fix updates well in advance, often to their detriment, to cope with Apple's slow process. A turnaround time of 2 days – and even if Apple manages to stay between 2-4 days on average – could mean happier developers, faster releases and updates, and, as a consequence, happier customers. It'll be interesting to see if these shorter review times will last until WWDC and if they're part of a bigger plan to meaningfully improve App Review for developers.